If you’ve ever fumbled with installing a car seat you may not be shocked to discover that nearly half of car seats are incorrectly installed even though the majority of parents are confident that their car seats are exactly as they should be. An incorrectly installed car seat may not protect your child in a collision, and in fact, may make injuries worse. The good news is that it’s fairly easy for a trained eye to spot car seat installation problems, and the fix is typically a small, quick adjustment. So how can parents find one of these professionals to take a look at how their car seats are installed to ensure their children are as safe as possible? It’s as simple as attending the upcoming Omaha Area Car Seat Check-Up Event brought to you by Great Plains Auto Body in partnership with Children’s Hospital & Medical Center. When? February 25th, 9 a.m. – 12 p.m.
What? 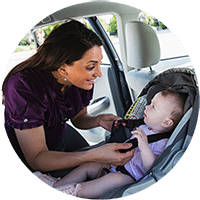 Certified volunteer car seat technicians inspect and teach you how to safely install your car seat(s). Plan on spending about 30 minutes per car seat with the certified technicians, but expect to wait in line before getting to the tech. Bring children, if possible. Expectant parents are welcome. Bring a friend/relative to help, if possible. Bring the vehicle owner’s and car seat manuals. It’s definitely worth the time it will take for an inspection; a recent study suggests children are at an increased risk for injury or death resulting from improper car seat usage. Don’t allow a car seat mistake to put your child at risk.